This new bong from Grace Glass features high quality construction, borosilicate glass and a classic scientific beaker design. With a powerful red color on the base, mouthpiece, ice pinches and on the bowl handle. 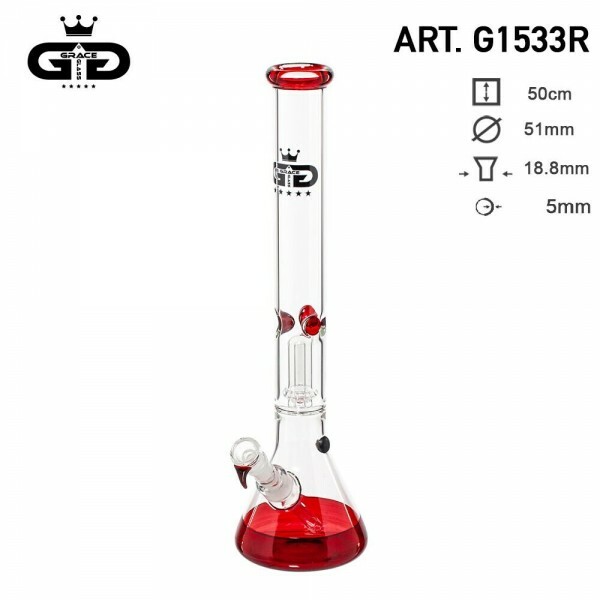 The waterpipe with an height of 49 cm comes with a matching 18mm glass funnel bowl with handle and a removable downstem for smooth, powerful tokes. The 3 ice pinches hold your ice to provide a cooling effect on your smoke when needed. There is also a splash guard filter for extra smoothnes.